Penn Community Bank President and CEO Jeane M. Coyle hands the keys to their new home to Imani, George and Lucy Muthoni-Mbugua at a ceremony on Feb. 25, 2016. Supporting homeownership is one of the cornerstones of Penn Community Bank’s mission, as it has been for the many decades our banks have served Bucks County. Penn Community Bank helped welcome home the Muthoni-Mbugua family recently, after the completion of the 101st affordable home built in Bucks County by Habitat for Humanity of Bucks County. 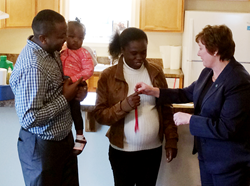 At a ceremony on Feb. 25, 2016, Penn Community Bank President and CEO Jeane M. Coyle handed the keys to the new home to Imani, George and Lucy Muthoni-Mbugua. The homeowners joined representatives from sponsors, local businesses and Habitat for Humanity for a special home dedication ceremony to recognize the completion of the project. The house was given a blessing by Curtis DeHaven, field coordinator of Bux-Mont Christian Church. Penn Community Bank donated the land on State Road in Croydon upon which the house was built. The bank also helped sponsor the project, joining co-sponsors Bucks County Foundation, Bux-Mont Christian Church, The Dow Chemical Company, Lower Bucks Hospital, Parx Casino, Samuel Adams Pennsylvania Brewery, Wells Fargo and William Penn Bank. Bank employees contributed to Penn Community Bank’s donations toward the Habitat project through “Jeans for a Cause.” Employees who donate $5 toward a designated charity can wear jeans to work one Friday each month. In February, donations went to Habitat Bucks. Many other bank team members, executives and board members contributed their time and talents throughout the year at build days to help construct the home. Habitat for Humanity of Bucks County broke ground on the home in April 2015. The construction of a Habitat home requires a local purchase of $60,000 in materials and jobs for area contractors. On average, Habitat homeowners pay $3,500 in local taxes annually and the total investment back to the community from each Habitat home is nearly $200,000. Formed in 2015 by the unification of longtime local banks First Federal of Bucks County and First Savings Bank of Perkasie, Penn Community Bank is Bucks County’s leading mutual financial organization. With more than $1.8 billion in assets, Penn Community Bank is Pennsylvania’s second largest mutual bank, large enough to compete - and thrive - alongside larger banks, while still offering personal service in every community it serves. Penn Community Bank was formed to strengthen mutual, independent banking in the area, creating a bank for people who prefer to do business with a financial institution that values people as much as it does profits. Photo Caption: Penn Community Bank President and CEO Jeane M. Coyle hands the keys to their new home to Imani, George and Lucy Muthoni-Mbugua at a ceremony on Feb. 25, 2016. Penn Community Bank donated the land upon which the house was built and helped sponsor the project, while bank employees and directors donated time and talents on build days to help construct the home. About Penn Community Bank: A Pennsylvania chartered stock savings bank, Penn Community Bank was created in 2015 by the unification of long-standing community banks First Federal of Bucks County and First Savings Bank of Perkasie. It holds more than $1.8 billion in assets and employs more than 300 people at 22 bank branches and two administrative centers throughout Bucks County. Penn Community Bank offers expert financial advice on banking, insurance and investments, delivered by friendly people through convenient services. Penn Community Bank’s mission is to help businesses grow and prosper, support individuals and families throughout their lifetimes, strengthen the local economy, and partner with local organizations to act as a catalyst for positive growth in every market it serves. About Habitat Bucks: The mission of Habitat for Humanity of Bucks County (Habitat Bucks) is, “Building homes, empowering families.” Habitat Bucks has an open-door policy: All who believe that everyone needs a decent, affordable place to live are welcome to help with the work, and they accept volunteers and supporters from all backgrounds who are willing to serve people in need of decent housing. The Habitat Bucks Homeownership Program provides an opportunity for low-income families to increase their independence and economic well-being through home ownership and educational opportunities. Habitat partner families work hard for their homes; they contribute an average of 200 hours of sweat equity and will pay a mortgage for their home. Through these unique programs, families acquire a sense of ownership and responsibility that they may not have as renters or tenants. Since their founding in 1990, Habitat Bucks has built 101 affordable homes in Bucks County. Through their A Brush With Kindness program, Habitat Bucks makes repairs to the exterior of homes, including painting, porch repair and the installation of handicapped accessible ramps. Revenue from Habitat ReStores provides a source of sustainable funding for the construction and repair of homes. For more information about Habitat Bucks, please call 215.822.2812 or visit: http://www.habitatbucks.org.